Do you feel like you’re drowning in the everyday stress-pool? . . . Wish you could make busy-ness a business so you’d be a millionaire? . . . Welcome to the maternal order of slightly sagging sisters of the 'hood. The motherhood. With her own offbeat brand of wit and near-wisdom, popular inspirational humorist Debora Coty addresses heart needs of moms drowning in the churning stress-pool of busyness. In her beloved mom-to-mom, grin-provoking style, Coty offers empathy, laughs, real-life stories, practical parenting survival tips, and fresh biblical insights to help you hear Papa God’s still, small voice through life’s chaos. Whether you're struggling with stress related to attitude, time-management, guilt trips, patience, or something in between. . .this humor-filled volume will deliver a much-needed smile and equip you with simple-to-implement tips for attaining the peace we all crave—the peace that passes all understanding. The cover...is wonderful!! I love the colors, the flowers, and the font! What mom wouldn't want to pick up a copy of this book? Or better yet, who wouldn't love being gifted a copy of this book? No one is immune to stress, least of all moms. 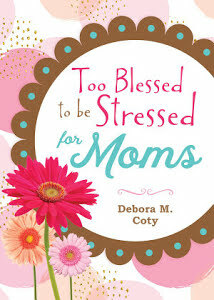 That's why Debora M. Coty, author of the best-selling Too Blessed to be Stressed series decided it was time to write an edition specifically addressing the stresses and needs in the daily life of moms. In Too Blessed to be Stressed for Moms (Shiloh Run Press, an imprint of Barbour Publishing), Deb offers empathy, laughs, real-life stories, practical parenting survival tips, and fresh biblical insights to help frazzled moms of all ages hear God's still, small voice through life's chaos.